The species in this cluster lack the cap scales that typify many species of Pholiota. 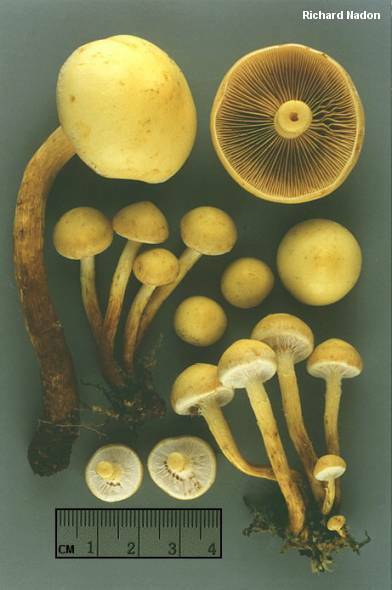 The mushrooms are yellowish to reddish brown, grow in clusters on rotting wood, and have rusty brown to dull brown spore prints. Microscopically, the species cluster--which is known to pholiotologists as subgenus Flammula--is recognized by the presence of gelatinized cells in the skin of the cap (which usually results in a cap that is slimy to the touch, at least when young); the absence of pleurocystidia; and spores that are at least weakly dextrinoid. 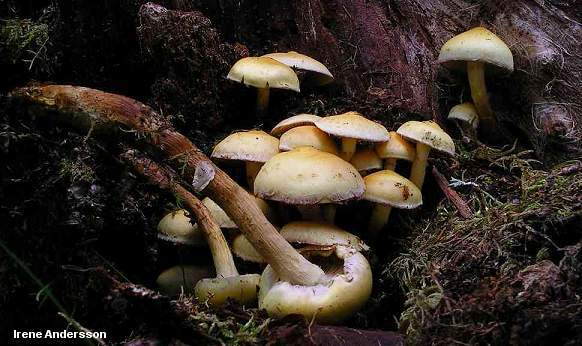 The principal species in the cluster are Pholiota alnicola (described below), Pholiota malicola, and Pholiota flavida. See the comments below for help separating them. Ecology: Saprobic; growing in clusters on the decaying wood of hardwoods and occasionally on the wood of conifers; late summer and fall (fall through spring in California); widely distributed in North America. Cap: 3-6 cm; convex, becoming broadly convex or nearly flat; slimy to sticky when fresh; yellow, becoming dark yellow and/or developing rusty or olive green shades; fairly smooth, but sometimes with fibers or tiny scales near the margin. 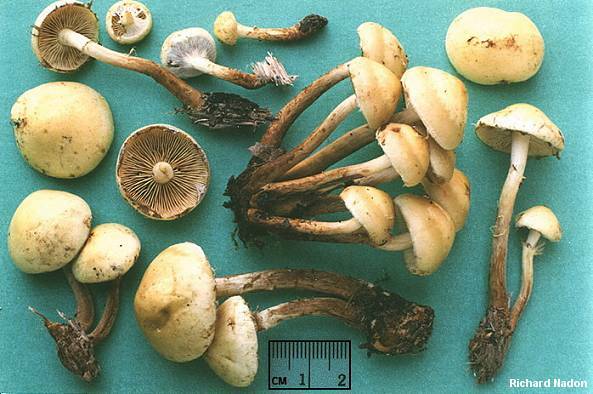 Gills: Attached to the stem; close; whitish or pale yellow at first, later becoming dirty brownish yellow or rusty brown; at first covered by a quickly disappearing, whitish to yellowish partial veil. Stem: 4-8 cm long; up to 1 cm thick; pale yellow at the apex and overall when young, becoming brownish from the base up; with, at most, a ring zone resulting from the partial veil; often covered with fibers, but not truly scaly. Odor and Taste: Odor not distinctive or fragrant; taste bitter. Microscopic Features: Spores 8-10 x 4-5.5 µ; smooth; elliptical; with an inconspicuous apical pore; somewhat dextrinoid. Pleurocystidia absent; cheilocystidia variously shaped, 22-46 x 3-6 µ. Cuticular elements subgelatinous, 2-4 µ wide. Clamp connections present. Pholiota malicola and Pholiota flavida taste mild, rather than bitter. The latter has spores measuring 7-9 x 4-5 µ, while the former has spores measuring 8-11 x 1.5-5.5 µ.
REFERENCES: (Fries, 1821) Singer, 1951. (Saccardo, 1887; Smith & Hesler, 1968; McNeil, 2006. Pholiota malicoa: Smith, Smith & Weber, 1979; Arora, 1986; Phillips, 1991/2005; Barron, 1999; McNeil, 2006. Pholiota flavida: Phillips, 1991/2005; Bessette, Miller, Bessette & Miller, 1995.) I have not collected these mushrooms.